Here in Kansas City there’s this fabulous nonprofit organization for women called WIN for KC. The whole mission of the group is to empower women through active events and community. (Yeah, you know we dig that.) 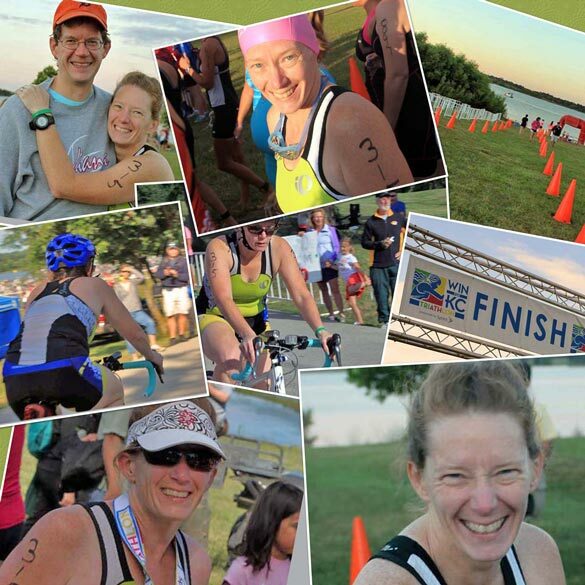 And one of its biggest events is the WIN for KC Tri, which is a women’s-only triathlon that has a reputation for being fun, ridiculously supportive and fabulous for all abilities, ages, races, shapes and sizes. In the coming months, you’ll probably be hearing a bit more about WIN for KC and us, but to give you a little flavor for them — and to highlight an organization that is truly changing lives — we wanted to share Jolyn Prater’s story with you. Jolyn got involved with WIN for KC and, although her success story was written a little more than a year ago (we’re sharing it from WIN for KC’s amazing Inspiration Station page), we think everyone will find it incredibly inspiring. We know we did! However, as of about 10 years ago, athlete is one of the least likely words you would have used to describe me. I was obese and on my way to morbid obesity. My life, including health, seemed to be an entity that controlled me. I was at the mercy of a sedentary lifestyle and comfort food. I wasn’t always this way. I had been an active child that spent many days accumulating scars and fond memories racing my Dad on my bike. I had been a Girl Scout who enjoyed camping and hiking. I played softball and while no home runs or breath-taking double plays were credited me, my end of year award was for Most Improved Player. Through junior high and high school I was a volleyball player, at 5 feet 6 inches I was not a star volleyball player but earned recognition for tenacity. The days of youth sports eventually gave way to working one, two, three or more part-time jobs to pay my way through college. I hit my 30s with few thoughts or recollections of hiking, camping, swimming, softball, volleyball or any other physical activity. Days turned into weeks and years of life spent in a cubicle. During the same decade following college, I met and married the love of my life, Bret. His prior decade too had been heavily influenced by convenience and comfort food fit for a bachelor. In our wedding pictures we are a very happy, albeit plump, pair. Then, it happened. Bret seemed to suddenly change his mind. He announced he wanted to lose weight and chose the South Beach Diet as his plan to achieve his goal. I committed to supporting his plan by experimenting with ways to cook the South Beach Diet way and cater to his tastes. His enthusiasm to change did not immediately inspire change in me. My thinking was still trapped in the lie that I was destined to be fat and unhealthy. I remember my first 5K charity walk. I was the very last one on the course being slowly stalked by a grumpy-looking sheriff in a car holding back traffic. Bret’s transformation was inspirational in time. In 2006, I decided to try Weight Watchers again. Bret committed to supporting me and rose early in the morning to chop fresh vegetables to ensure that I had plenty of good food before I left for my long commute and work day. Every weigh-in with loss we celebrated. We learned to celebrate victories and holidays without food as the main event. We also learned to not drown sadness and disappointments with food or eat from boredom or stress. Like a snowball turning into an avalanche, little achievements started adding up to big change. With every success, the idea that I was captive to a life of obesity diminished. In my own time, I too lost 50 or so pounds and learned many good life lessons in the process. Perseverance and consistency are keys to success. After losing weight that I never thought possible, I questioned what else seemed difficult or open to change. I started walking and using an elliptical trainer. Once those became easier, I sought new activities to try just because I either had never tried or had not tried them in years. A little over 5 years ago, I remembered that 5K walk that was so difficult and decided I would run a 5K. My goal for the day was to hang tough and run the entire 3.1 miles. As my cheer squad ushered me over the finish line, tears of happiness and exhaustion escaped down my cheek. The moment of realization that impossible is negotiable was powerful. Now that 3.1 miles was complete, “What else?” I asked myself. Next came a 10K and a half marathon. I found a place willing to teach adults to swim and began to conquer my fear of the water. Bret and I now enjoy date nights in Spin class and group rides in the KC area through the spring, summer and fall. What endeavor do I have my sights set on now? I have entered the WIN for KC Women’s triathlon to challenge my abilities and assumptions. I have focus and desire to meet this challenge. I have the support of friends, family and trainers. My face may still not make the cover of Runner’s World. My first sprint triathlon will not be featured on Sports Center. However, regardless of the media coverage, I am an athlete and soon I will be a triathlete.